For more than 100 years, New York’s best corporate framing and art restoration shop has been Heritage Frame & Picture, a 4th generation custom art framing business founded in 1878 under the name New York Frame & Picture Co. Corporate custom art, mirror and picture frames are specific for commercial establishments and residential buildings. Corporate framing is also known as industrial framing and commercial framing. This includes residential complexes, banks, law firms, restaurants, hotels, museums, art galleries, government offices, schools, universities sports arenas, public spaces, casinos, religious institutions, and not for profits. Unlike custom frames for private residences, corporate framing often incorporates working with event planners, interior designers or building managers. Heritage Frame understands what is required for these environments in terms of coordinating work schedules, working with teams, anchoring art to walls to prevent accidents or theft and ensuring the proper quality of the frame, matting, and installation hardware is utilized. When framing art, memorabilia, posters, mirrors or pictures for an art collector or a family, the client is given the same attention as our corporate framing clients. The difference usually amounts to the volume of work being framed, the necessity to use a varied amount of frames due to the environment the art will be installed as well as the artwork contained within. Most framing shops do not have the experience or expertise to work with commercial/ industrial picture framing clients. The corporate environment can lend itself to working long hours, often many after hours and weekends as well as often having to restore damaged, stained or ripped art in their collection. Heritage Frame’s primary clients are corporate and we work nationwide with many of our clients by installing artwork throughout their offices in and outside of New York. We also travel for art restoration work and to frame and install art for events, and for corporate gift giving. We have an extensive list of referrals and client list. We have also been featured in the news and received awards for our accomplishments and success in art framing and art restoration. If you are a looking for an experienced, professional and enjoyable custom framing company to work with, please call Heritage Frame & Picture Co. We are not the low price leader. We are the leader in high-quality frames, customer service, and experience. Yes, we do give free estimates on art restoration custom and corporate art, picture, and mirror frames and art installation. Please call (212)233-3205 or (914)332-5200. Heritage Frame is the Picture, Mirror and Photo Framing Shop Queens residents and business owners call the most. Heritage Frame & Picture Co has been providing custom framing, art restoration and art installation since 1878. Many of the Queens hotels, restaurants, art galleries, photographers, colleges, universities, entertainment complexes, movie studios, sports teams, banks, interior designers and law firms hire Heritage Frame. Heritage Frame is known for our extensive experience, excellent customer service and high quality picture and photo framing and installations. Known worldwide for its imaginative graffiti artists, architecture, parks like Flushing Meadow, Astoria Park, Rainey Park and socrates sculpture park , Queens is an artist, photographers and entertainment aficionado's dream. Also in Queens are the famous Silvercup Studios and Kaufman Studios as well as the Museum of the Moving Image. It is this level of entertainment, artistry and creativity that makes Queens art collectors and families seek the best in custom art, mirror and picture framing services. This is also why they contact Heritage Frame & Picture Co. At Heritage Frame, we have a large and extensive assortment of picture frames, matting and hardware to choose. With 140 years experience in picture framing, art restoration and art installation- Heritage Frame is the most successful custom framing and corporate framing shop in New York. In addition to being one of the highest rated 5 star framing shops on Google Business reviews, Heritage Frame is highly recommended by our clients, some of whom we have be providing framing and art installation for more than 100 years. Even though Heritage Frame was founded in the 1800's, we are a 21 century photo framing business. We provide online custom framing to our customers and make this service available 24 hours per day. 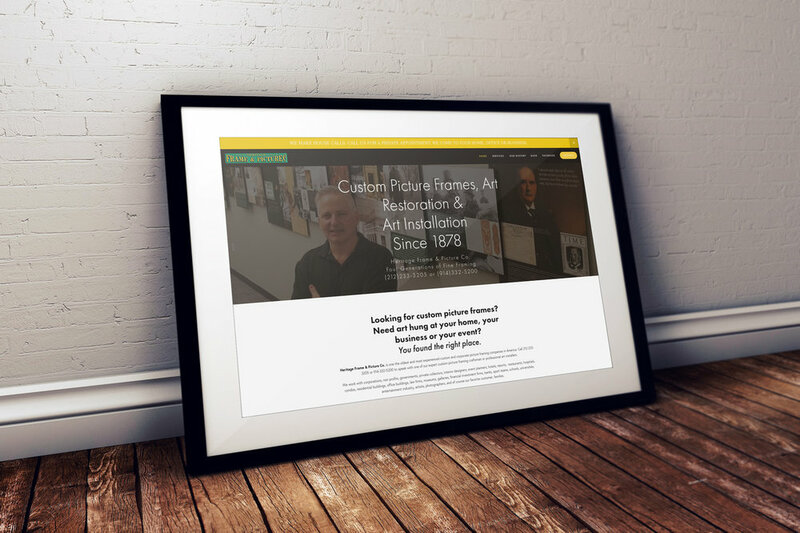 All you have to do is login to our online custom framing portal powered by larson juhl- A Berkshire Hathaway Company. In addition, Heritage Frame offers our Queens and NY customers, FREE art framing, restoration and art installation quotes. Simply call us to arrange an appointment. In addition to FREE quotes, we also make house calls. To have a private art framing, art restoration or art installation meeting, call Ted Howell and Ted or one of our associates will meet with you at our shop or at your home, business or somewhere in between. Did we mention we also pick up and ship everywhere? Once you decide to do business with Heritage Frame, we make sure we have your art, mirrors, photos, memorabilia, posters or collectables professionally packaged and shipped to our location. Once there it is treated with the utmost care and then promptly shipped back to your location or wherever you desire to have the work shipped. Heritage Frame is committed to providing the best picture and mirror framing in Queens and throughout New York. When you call Heritage Frame, you are calling on of the most experienced framing businesses in the United States. As a 4th generation framing businesses, we think of our customers as friends and even as family. Our goal is to always make our customers #1 and to remain the #1 custom framing, art restoration and art installation shop in New York. Thank you for taking the time to learn about Heritage Frame & Picture Co. We also have a brochure. Please download our brochure by clicking here. Are you searching for custom picture, photo or mirror framing in Croton NY (10520)? If so, Heritage Frame & Picture Co., one of the oldest and most successful picture framing, art restoration and art installation framing shops is near you in Croton. In addition, Heritage frame is available to come to your home or office in Croton if you call to schedule an appointment. To schedule a private custom framing or corporate framing appointment, please call Ted Howell, owner of Heritage Frame at (914)332-5200 -or- (212)233-3205. Also, to get FREE custom picture framing, art restoration and art installation estimates for your home or office, you can call the number provided or you can contact us here on our website via our contact page. By the way, you can also come by our framing shop which is conveniently located near Croton in Tarrytown. Are you interested in hanging pictures in your home, office or building? Do you know how to create a photo gallery wall? If you are interested in having photos, posters, certificates, diplomas, portraits or any other item framed and hung, call Heritage Frame. We provide corporate / industrial framing, corporate gift framing, art installation for corporate events and work with interior designers, hotels, restaurants, non profits, galleries, photographers, artists, graphic designers, schools and universities. We have a large variety of photo and picture frames including wood frames, metal frames, antique frames, museum quality frames, modern frames, silver frames and classic frames. If you would like to compare and test out different picture frames on the internet from the comfort of your home of office, try our online custom framing site. This site allows you to upload an image via a jpeg or png to the site and compare frames and matting. You can also try out different wall colors to see how your picture would look in your home or office. Once you decide on a frame, save a copy and let us know what you selected. You can call us or stop by our frame shop in Tarrytown. If you prefer us to come to your location in Croton, contact us to make an appointment. During that time we will bring sample frames, matting, hardware and can provide you with an on site quote for framing your picture and installing. Now that you have your photos and pictures custom framed by Heritage Frame, you may want to create a photo gallery wall. Photo gallery walls are popular because it allows you to maximize wall space in your home, office or building. In addition, when the photos are hung properly, the framed works create another set of artwork within their design on the wall. Photo galleries are also a way to mix different picture frames together. You can mix antique frames with modern frames, metal frames and gold frames with various shapes and sizes. The best way to create a photo wall gallery is to allow your creativity to flow. Mix different color frames together and shapes. One of the important things to keep the wall in balance is to space the frames evenly apart. Also place frames at eye level with some picture frames slightly higher and some photo frames lower. You can make the wall a gallery of family portraits, a wall displaying vacations, special events or various products as well as books, antiques, letters, cards, posters, menus, food or whatever excites you. We have installed art and photo galleries in art galleries, homes, restaurants, schools, law firms, banks, entertainment companies, sport teams and stadiums, plus many other residential and commercial venues. If you are looking for custom picture or photo frames or need someone to restore your art, photos or frames, please call Heritage Frame & Picture Co. We have been in business for 140 years, since 1878. We are a 4th generation family owned custom picture, photo framing, art restoration and art installation business. We look forward to framing or installing art, pictures, posters, diplomas or antiques in your business or home. Thank you for learning more about Heritage Frame, the #1 rated best custom picture framing business in New York City and Westchester County. Rye NY Custom photo, art and picture framing shop - Heritage Frame & Picture Co.
Harrison NY (10528) picture, mirror and art framing and restoration shop Heritage Frame & Picture Co is near you and gives FREE framing estimates. Established in 1878 in lower Manhattan, New York City- Heritage Frame is a 4 generation framing, art restoration and art installation business. Owner, President and Master custom framing craftsmen, Ted Howell has extended the family business to the internet. To better serve our picture, art and photo framing clients Heritage Frame offers online custom framing technology. The online art, photo and mirror framing allows customers in Harrison NY (10528) upload digital photos to the website and select the frame and well as the matting and wall colors. This process has made custom mirror framing and photo framing easy for customers to shop as well as decide in advance what type and style of frame they want to Harrison from the comfort of their home or office. Yes, HeritageFrame.com makes house calls. We come to your home or office. If you prefer a private appointment at your home or business in Harrison instead of visiting our Heritage Frame- Tarrytown NY framing shop, we will come to your location. Call Heritage Frame & Picture Co at (212) 233-3205 or (914) 332-5200 to schedule an appointment. Ted Howell, will make sure you are have the best service. Ted will also bring an assortment of picture and mirror frames, matting and materials for you to select. You can also go to the Heritage Frame & Picture Co online custom framing site so you can get familiar and request to see the frames of your choice. Heritage Frame works with interior designers, decorators, artists, photographers, galleries, restaurants, hotels, law firms, banks and many other corporate entity in need of corporate or industrial framing, custom framing or art installation or restoration. Heritage Frame has more than 140 years experience in custom framing, art restoration and art installation. Heritage Frame also has experience in working with you and your insurance company if you have an insurance claim. We can determine the replacement cost of your art, photo or picture frames, how much restoring your art will cost as well as the cost to hang art at your location. Our framing, art restoration and art installation business has lasted this many years because we love what we do and care about our customers and clients. Heritage Frame is a family owned business that wants to do business with your business or family for years. We do what it takes to make our work the best. If you are searching for FREE art installation, art restoration or FREE art, mirror or photo framing estimates in Harrison call us, stop by our shop or contact us on our contact form. We have extensive experience framing and installing artwork in private homes, commercial buildings, hotels, restaurants, residential buildings and government offices. Heritage Frame is able to frame your memorabilia, photographs, fine art, posters or diplomas anywhere in your home or office. We also frame children's art and install.